For the home cook, investing in a well made Chef’s knife is a great idea. 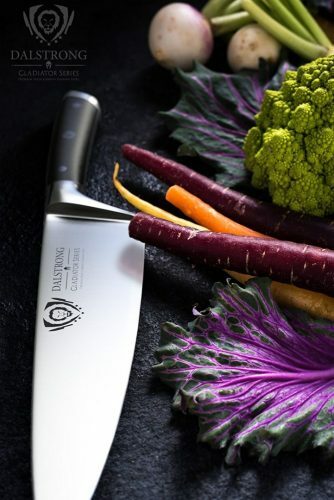 Many who choose a knife like this find it quickly becomes the only blade they need in their kitchen, and with proper care these kinds of knives can last up to 30 years. There are so many options for chef style knives, whether you’re looking to purchase your first or fiftieth blade of this sort. We’ve rounded up our favourites to help you decide. Consider reading our kitchen bin review if you’re looking to update your kitchen. The Imarku Pro Kitchen knife is an aesthetically pleasing, excellent value knife for home chefs looking to upgrade. It’s durable and multi purpose, so has the scope to become the only knife you need in your home. 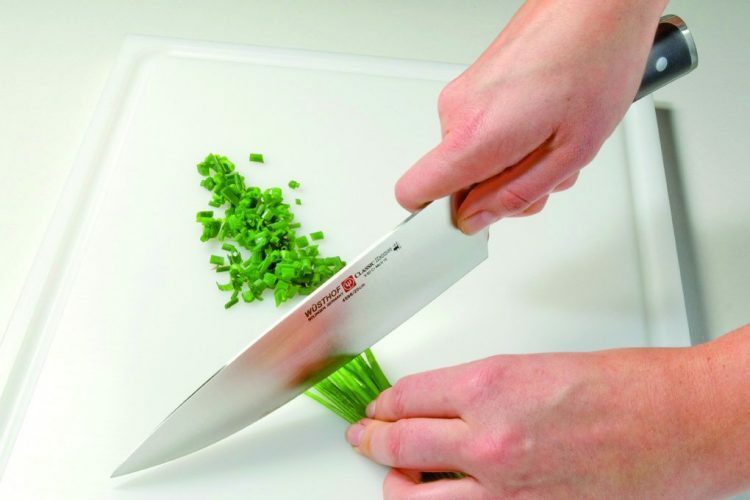 The Imarku Pro Kitchen 8 inch knife is a extremely well balanced piece of kitchen equipment. This, along with the ergonomically shaped handle, means it’s easy to use and will minimise fatigue if you use it for a long time. 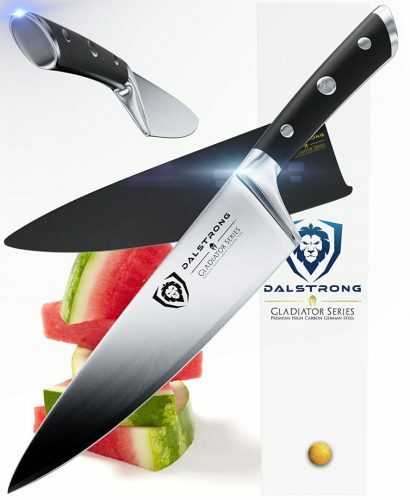 It’s durable, with the addition of carbon ensuring the blade will last. It’s sharp and thin, although not too thin, and capable of performing a variety of tasks, from removing meat from bones to thinly slicing garlic. While the knife is well balanced and comfortable for the use of home cooks, professional chefs may find it somewhat lacking and cumbersome for all day use. Some users have reported they find it difficult to cut through thicker vegetables, like carrots, and have had to use a lot of strength to slice these types of foods. J.A. Henckels are one of the oldest and largest knife manufacturers in the world. 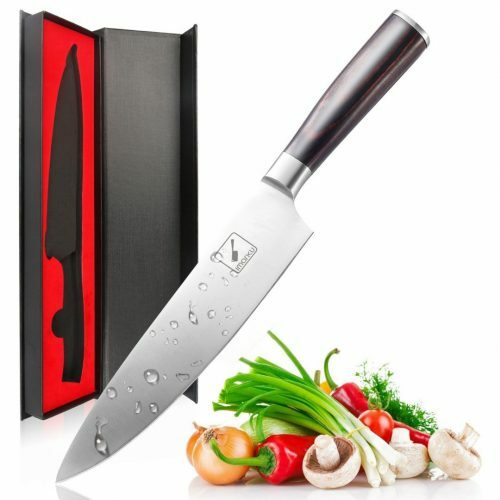 This knife is part of their International range, which produce more mass market knives to cater for home cooks. The Classic 8” knife is well balanced and versatile, and would be a good addition to any home kitchen. 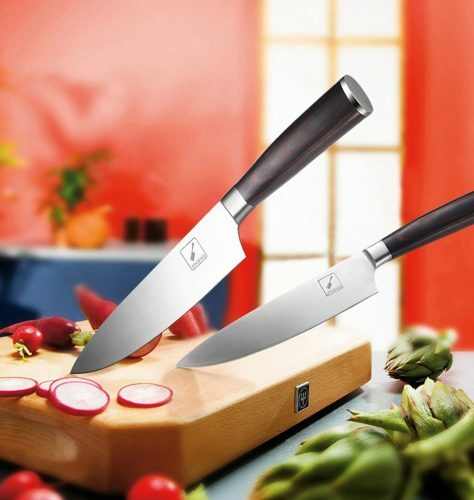 The Henckels Classic Chef’s Knife is made from a mix of steel and carbon, ensuring durability and longevity. It’s a hard wearing knife that stays sharp and will not stain. The knife has a full tang, which means the blade extends into the handle rather than being fixed to its outside. This makes the knife extra stable, balanced and durable. It’s dishwasher safe, although the manufacturers note that it’s important to fully disinfect the knife if it’s used to cut raw meat. Some customers have found the handle to be uncomfortable for prolonged use, and have reported that the top of the knife feels too sharp to the touch and so adds to their discomfort. Wusthof are a German firm who have been making knives for over 200 years. The Ikon 8 inch knife is made from a single piece of stainless steel that has been laser cut for precision, and is a little heavier than most knives of its size. Wusthof’s Ikon 8 inch knife boasts a number of bolsters which helps to balance the knife and give huge amounts of control when using it. It also means you can easily sharpen the entire length of the blade. 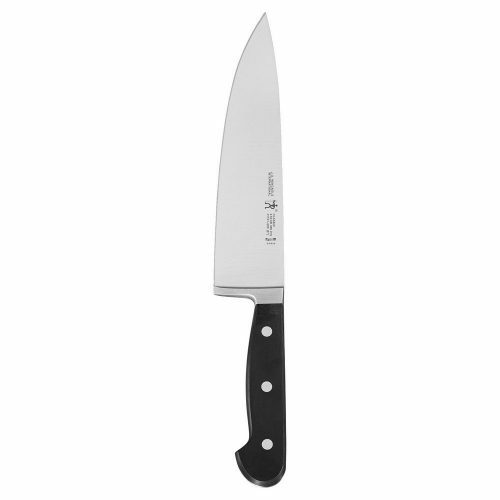 As with the Henckels Classic Chef’s Knife, the Ikon 8 inch has full tang for added support and durability. The knife is a little heavier than most of its size so is favoured by those who like their blade to carry some weight, and those with larger hands. It can be hard to perform precision cuts with this knife. For example, cutting into a tomato without snagging the skin is quite difficult. The shape of the handle can take some getting used to. 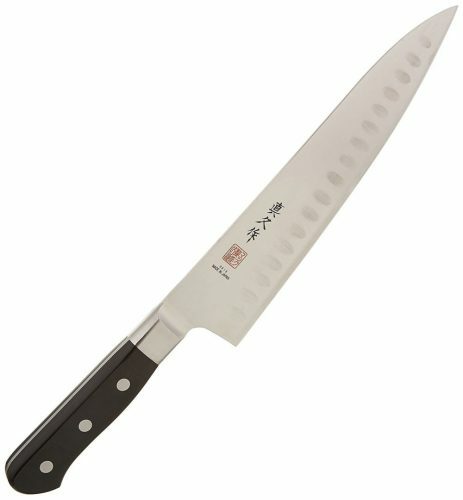 Mac knives are designed and made in Japan, using harder, thinner steel in the classic shape of a standard chef’s knife. 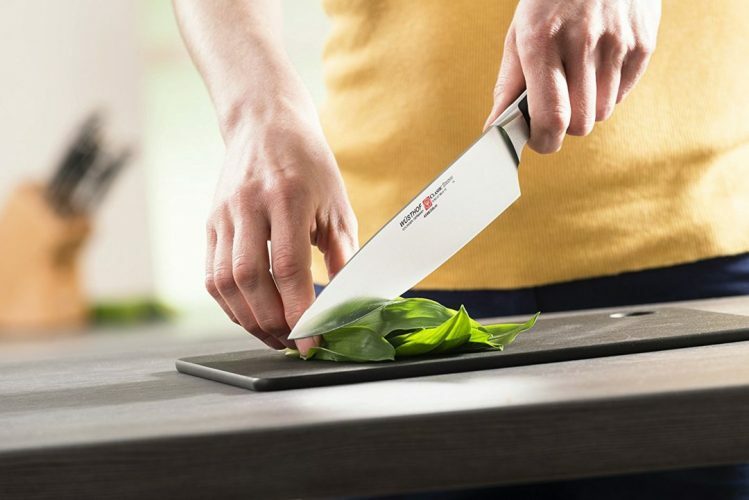 The Hollow Edge Chef’s Knife is widely regarded as one of the best knives in the market, with excellent balance, a wide range of functions and great comfort, regardless of hand size. Unusually, the Hollow Edge knife is both thin bladed and reasonably heavy, offering a fairly unique sense of balance and control, and ensuring your blade will be razor sharp. The knife is truly multi functional, and is as effective at removing hard skin from veg like butternut squash as it is cutting through tomatoes without snagging or squashing the fruit. The dimples in the blade help the knife to slide easily through sticky foods without getting caught. 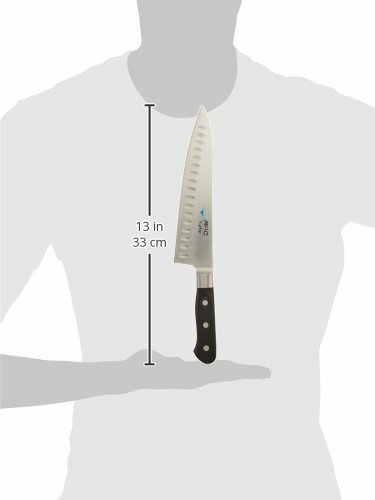 The balance and comfort offered mean the knife would be suitable for chefs as well as home cooks. It can’t go in the dishwasher, so will need hand washing after each use. For absolute beginners, the knife may be a little too thin. Shun is another, well-known Japanese knife production brand. Their manufacturing methods have evolved from the ancient practise of making samurai swords, and they are highly focused on precision engineering. The DM0706 is emblematic of Shun’s principles, and is a great knife for those who know what they’re doing when it comes to chopping. Shun’s DM0706 knife is made from a central cone of “super steel” which has been bound in 32 layers of high carbon stainless steel. Not only does this process add to the aesthetic of the knife, but it also means it’s extremely durable and retains its sharpness. The blade is thin but sharp, allowing it to slice through thick foods without much effort, as well as making it easy to chop squishier food without squashing. The D-shaped handle is quite unique, and if it fits your hand you might find this to be the most comfortable knife you’ve ever used. The D-shaped handle could be a curse as well as a blessing. If it doesn’t fit the shape of your hand, you might find the DM0706 really uncomfortable to use, and it also means the knife isn’t that suitable for left handed users. The layered manufacturing leaves this knife more susceptible to chips if it isn’t used with the proper technique, so isn’t that suitable for beginners. 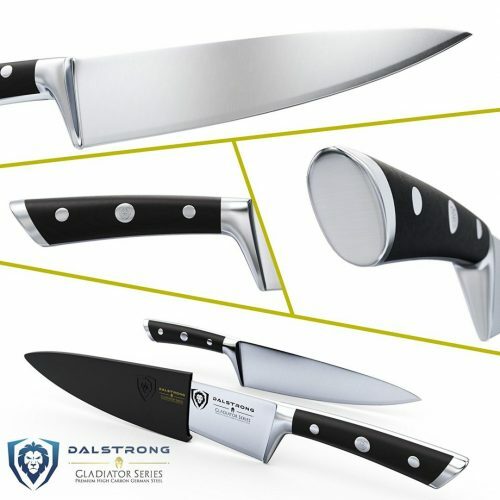 Dalstrong’s 8 inch chef knife is a well made, sharp and beautiful knife that is a lot heavier than most of its size. With its large handle too, it may be that this knife is more suited to experienced cooks who prefer a heavier blade. The handle of Dalstrong’s 8 inch knife is longer than most of its size, and so is especially good for anyone with large hands. Full tang means it is durable and well balanced. The knife is beautiful, comes well presented, and includes a sheath for safe storage. Despite the blade’s sharpness, it is too heavy to effectively cut through soft foods like tomatoes, and struggles to slice without squashing. It is difficult to control the knife, and the sharpness varies depending on which part of the blade you use. 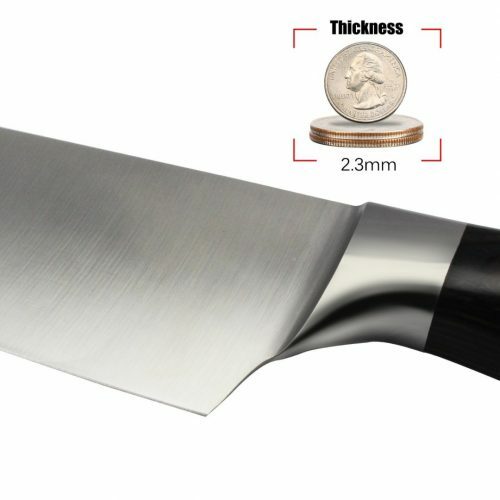 As mentioned, the handle is large for a knife of this size and so could be uncomfortable for users who are just beginning with chef’s knives or who have small hands.